Craftsman opener repair and installation in Ottawa Garage Doors. parts are readily available, and they can be installed by Ottawa garage doors. If you are in the market for a Craftsman opener, or need some information on troubleshooting and finding replacement parts, you can contact us for more info. 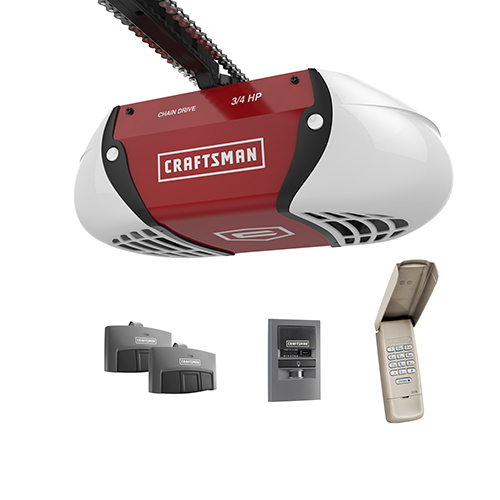 Enjoy a great end to every day and call Ottawa Garage Doors to install the Craftsman Opener with Anti-Burglary Coding today. The 1/2 HP motor lifts your garage doors gently and doesn't close until it's sure you've arrived safely inside. You don't have to rush in because advanced sensors will reverse the closing doors if they detect your car's motion. Once you're in, the PosiLock system will make sure the garage doors are closed tight behind you. Craftsman garage door openers come with safety sensors that project an infrared light beam across the garage door opening. The opener will automatically reverse door operation if anything interrupts the light beam or the garage door actually comes in contact with a person or object. For security, the remote controls provided with the opener are now equipped with the latest rolling code technology. Each time the remote button is pressed, a new randomly generated code is created. You won’t have to worry about a neighbor’s remote accidentally opening your garage door.